What is it about Indian batsmen and Eden Gardens? The love affair has been going on for decades, with some of the most memorable Test matches in Indian history coming at this venue. It’s like the city of Kolkata brings out the best in some of the Indian cricketers, the nonchalant Mohammad Azharuddin, the classy VVS Laxman, spin-wizard Harbhajan Singh and the hitman Rohit Sharma to name a few. November 2013, West Indies touring India in a hastily arranged two match Test series, as Sachin Tendulkar sets up for his final swan-song in his 25-year old career. The first of the two matches was played at Eden Gardens, which saw two debutants for Team India. The talented Rohit Sharma, who had already taken the limited over cricketing world by storm, and fast bowler Mohammad Shami, playing at his Ranji home ground. The Windies won the toss and decided to bat, but failed to impress as they could only muster 234 runs in the first innings, with Shami picking 4 wickets. The Indian top-order had a rare off day as they were reduced to 82 for 4. In walked Sharma, with Virat Kohli at the other end. In the space of 2 overs and one run, India lost Kohli as well and they were in a dangerous position at 83 for 5. Sharma along with Dhoni weathered the storm and put on 73 runs when the captain was dismissed for 42 with India in a spot of bother at 156 for 6. Sharma, though, stood firm and along with Ashwin, made the West Indies attack toil and dragged his team out of the trouble they had put themselves in. He showed immense confidence for a debutant, backed his ability and went on to score a very vital 177 for his team. Ashwin (124) also managed to get to a hundred, his second in Tests and against the same opposition as India finished their first innings at 453 with a lead of 219 runs. Indian bowlers managed to make light work of the Windies batting in the second innings, dismissing them for a paltry 168, helping India win by an innings and 51 runs. Debutant Shami again impressed with a five-for. 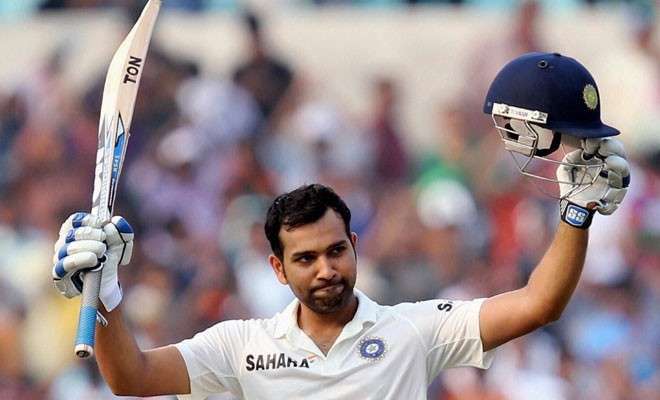 Rohit Sharma, deservedly won the Man of the Match award, after playing a classy innings under pressure on his debut.